The low point of the book was the tirade written by his writer Charlie Wetzel in Chapter 5, which describes his own perspective on Maxwell's connection skills. The piece is redundant and boring and glorifies Maxwell's amazing skills to the point where we roll our eyes and yearn to skip ahead. Directly after this tirade, Maxwell immediately comments on his awareness of this to be self-serving which is quite comical, but it still doesn't redeem the boring tirade. 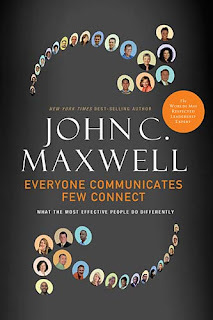 Overall, the book is extremely beneficial and helpful from an interpersonal communications standpoint. For introverted people like me who do great work but fail to be social and connect, this book will help develop you.